LONDON (AP) — Setting a world record for profit by a soccer team while keeping player costs down, Tottenham’s financial gamble is paying off — for now. Tottenham moved back into third place in the Premier League on Wednesday when its new 1-billion pound ($1.3 billion) stadium opened with a 2-0 victory over Crystal Palace. The next morning, the club posted its financial report on the British company registry that showed a profit of 112.95 million pounds ($148 million) in the year ending last June 30. That eclipsed Liverpool’s profit of 106 million pounds ($139 million) last season. Tottenham has qualified for three consecutive Champions League seasons while generating less income than rivals for the Premier League’s top four places. But Spurs have also spent far less on their squad, according to an Associated Press analysis of financial records. Tottenham’s turnover of 381 million pounds ($500 million) and wage bill of 148 million pounds ($194 million) was significantly surpassed in the last financial year by the two teams higher in the league — Manchester City and Liverpool — and the three teams below — Arsenal, Chelsea and Manchester United. Those five teams also spent more on agents, who facilitate transfers and contracts negotiations with existing players. While four of the top six have won the Premier League trophy during the last 15 years, Spurs have not won the English title since 1961 or any competition since the 2008 League Cup. Tottenham is paying for its 62,062-capacity stadium with a 637-million pound (currently $828 million) credit facility that has an April 2022 expiration. While Tottenham was building a new stadium on the site of its old 36,310-seat White Hart Lane, the team played at 90,000-capacity Wembley, leading home league attendance to more than double from 601,000 to 1.29 million. 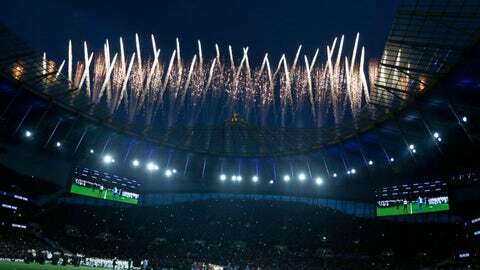 That sent matchday revenue soaring from 45.3 million pounds ($59 million) in the final season at White Hart Lane to 70.95 million pounds ($93 million) in the full campaign at Wembley.